5BMF and Brooklyn Art Song Society team up to present Hugo Wolf’s complete Mörike-Lieder, led by world renowned pianist Martin Katz. In honor of WorldPride and the 50-year commemoration of Stonewall, 5BMF joins with New York Festival of Song and the LGBT Center to present two innovative programs celebrating LGBT voices, composers, poets and artists. Season 12 is here! Check out our full season listing and buy tickets today to reserve your seats across the boroughs. TENET | Read Jon Sobel’s review on Blogcritic.org of our season closing presentation of TENET in May 2018. LORELEI ENSEMBLE | Read TheaterScene.net’s glowing review of our February 2018 presentation of Lorelei. FIVE BOROUGH SONGBOOK BROOKLYN PREMIERE | Read Berkshire Fine Arts’ review of the final borough premiere of our acclaimed Five Borough Songbook, Volume II. 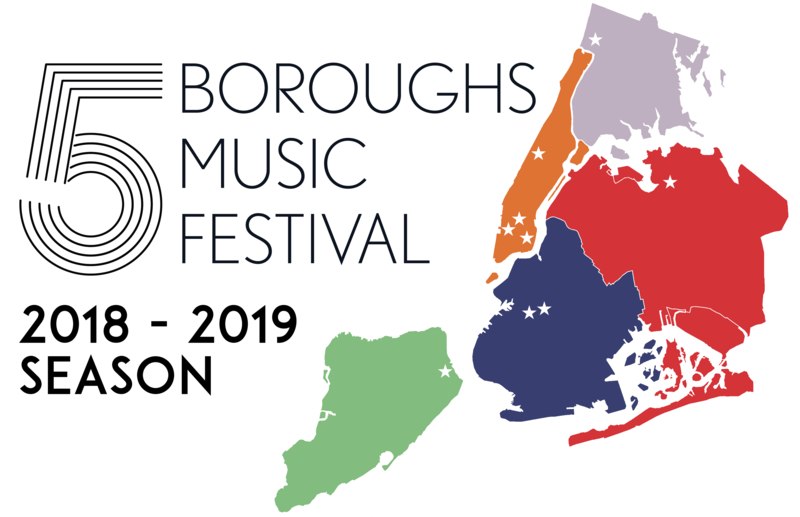 Take a musical journey around NYC with Five Boroughs Music Festival! Each season, we bring world-class, affordable chamber music programming to all corners of New York City, showcasing the industry’s best and brightest musical stars in exciting venues all over the boroughs. We invite you to explore our current season concerts, learn more about our special projects, sign up for our mailing list, and learn how you can become part of the 5BMF family.